So to start of with I have some exciting news! I have decided to release an Ebook after the bake off with all of my creations along the way! 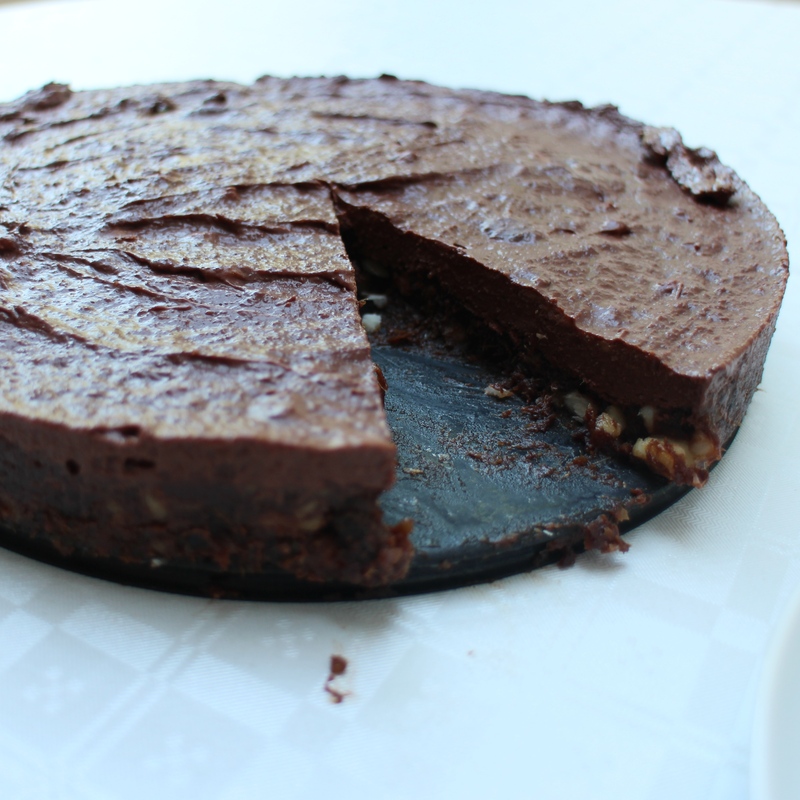 This week the recipe is honestly probably the best thing I’ve come up with: Raw Chocolate Torte. Although it is higher in calorie than my other recipes, it is most definitely dessert worthy and although rich, it is a light and delicious summer recipe which will be available in the Ebook. I think you’ll all love it! Tip: The key thing about this Torte which is better than many alternatives is that it won’t leave you with a big sugar crash later in the day. I have used Agave syrup and coconut sugar (which is not refined) to sweeten it which are slower releasing and far better to add to your baking. If you are looking to make your cakes a little healthier you can simply replace the sugar in a recipe with coconut sugar (although be careful as coconut sugar can dry out cakes a bit so you may have to compensate with other ingredients!) and its roughly 2/3 agave to 1 cup of sugar. Keep your eyes open for more details regarding the Ebook which will be released next month! It’s that time of year again… the time of year baking-lovers and Mary Berry fan girls like me live for… The Great British Bake Off is back. Every year I’ve said that I want to bake something along with the show every week, and every year I’ve never done it. This year I decide d it was time! the recipe, I was happy with how it turned out. However, the consistency wasn’t quite right. It turned out more like a dense malt-loaf texture than a fluffy Madiera cake and the crack on the cake wasn’t quite up to Mary’s standards. When I’ve perfected the recipe I will share it but for now it will remain a secret! This week however I will share with you my mum and I’s tried and tested biscotti recipe. We like to call them ‘Nev’s Biscotti’ after a very special friend. They really are delicious and are slightly healthier than the shop bought alternatives and standard recipes due to their lack of butter, refined sugar and flour with higher protein content. Here it is! Bake the almonds on the oven on 180C fan for ten minutes. Remove and cool and turn the oven down to 150C. When the almond are cool chop into pieces. Beat the eggs, vanilla, almond extract and set aside. In another bowl combine to flour, oatbran, sugar, baking powder and salt. Add the egg mixture and beat to form a sticky dough. Add the cranberries and almond pieces and fold in using a spoon. A silicone sheet pour the mixture to form two long sausage shapes about 30cms long, 8cms wide and bake for 30-40 mins or until golden brown and firm to the touch. Removed from the oven and leave to cool for a few minutes then cut into slices of about 1.5/2cms wide and place back on their sides and into the oven for a further 5-7 minutes each side. If you do make them be sure to let us know by tagging us on instagram/twitter/facebook as we would love to see!